You are here: Home » News » Live At The Target… on CD, and on stage! 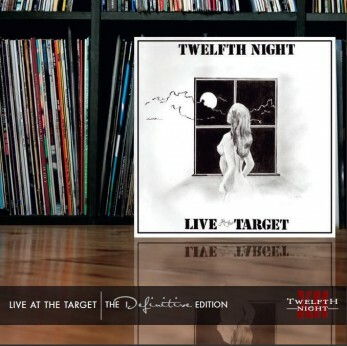 We are delighted to announce that our latest Definitive Edition, Live At The Target, will be released on 6 January 2012 through F2 Records. As with our previous Definitive Editions, we have taken the opportunity to completely revisit the album, adding both new artwork and a full second disc of bonus tracks! The tracks on this second CD are mostly from other pub gigs, with a couple of extremely rare studio recordings included for good measure. In total there is over 2 hours of music. The original album which we recorded and released in 1981 was a real breakthrough for us … it was our first vinyl album (or LP as we used to call them…) and our first nationally available recording. We’re still very proud of it. Disc one contains the four tracks from the original album, which we decided to leave on their own: Für Helene I, After the Eclipse, East to West and Sequences. Entropy and Keep The Aspidistra Flying are from the spring tour immediately following the release of the Live At The Target album and were recorded at the Old Five Bells in Northampton. Encore Une Fois and Freddie Hepburn date from the year before, having been recorded at a memorable gig at the Bridgehouse, Bracknell: one that we hope to issue in its entirety one day as part of our ‘Archive Release’ series. Afghan Single and Für Helene I are the only studio recordings featured on this double CD. Recorded at Woodcray Studio in May 1981, there was a short teaser of this piece on our Play On DVD, but the full recording has never appeared on a TN release until now. Für Helene I was recorded at Arny’s Shack in Bournemouth in the summer of 1980 as part of the sessions that resulted in the Early Material cassette album. It was released as the B-side of our first single The Cunning Man (which featured vocalist, Electra) and has never been released on CD until now. The Cunning Man was performed instrumentally from time to time, so we have included the only recording of this version that we have in our archives, taken from the ‘Midsummer Rock’ gig at Reading University in June 80. Finally, another pair of previously unreleased versions of classic instrumental TN… Afghan Red (the full version) – one of our most popular early tracks – recorded at The Target two months before the live album. And to close the album – as it used to close the live show back in the very earliest days – Für Helene II – recorded at Reading University in November 1979. This was our 8th gig as Twelfth Night and our first gig as a 4-piece. It is also is the oldest recording we’ve ever released on CD – so far… The CD includes a fantastic 16-page booklet, with some new sleevenotes and lots of previously unseen archive photographs. As with our other Definitive Editions, we intend that this is the last time that this album will be re-released … and as we have had many requests for Live At The Target over the last 2-3 years, we’re delighted to make it available once again. The album is being issued on the F2 (Festival Music) label with an official release date of the 6th of January next year – but in keeping with the usual practice we have persuaded Dave Robinson at F2 to let us have copies in advance of the official release date – so we can pass these on to you as soon as copies are available. You can pre-order Live at the Target today for just £11 (plus postage), and we will send it to you as soon as we get our copies (which we hope will be in the week before Christmas). As usual the easiest way to pay is by Paypal – please use briandevoil@twelfthnight.info – alternatively send a postal order or a cheque (drawn on a UK bank), payable to Brian Devoil to The Brambles, 1c Doggetts Farm Road, Higher Denham, Bucks UB9 5EH. Postage costs are £1.00 for the first CD, then 50p for each additional CD (to UK), £2.00 for the first CD, then 50p for each additional CD (to Europe), and £2.00 for the first CD, then £1.00 for each additional CD (for the rest of the world). Finally we would like to say a very big ‘Thank You’ to Andy Wild, Mark Hughes, Dave Robinson and Paul Tippett for all their help and hard work in putting this album together. Thanks guys! As we mentioned in our last newsletter, for ongoing projects we will draw from whoever is available from the various members of the TN family. Our line-up for The Peel in January will be Brian, Rev, Clive, Mark and Dean. However for Nearfest next June, Clive and Rev are not available, so the line-up will comprise Brian, Andy (S), Dean, Roy and another (tbc). As I’m sure most of you realise getting all of us together to rehearse and gig is becoming increasingly difficult because of work and family commitments, but as we are all keen to continue performing and playing the music we love, we have adopted an approach that allows us to be flexible and accept as many bookings as we can. For NEARFest the focus will be more on the songs from Art & Illusion and XII, although the earlier classics will not be ignored!